As the result of looking a Corporate Effectuation from a personal development perspective, I came across the Managing Oneself Harvard Business Review article from Peter F. Drucker. 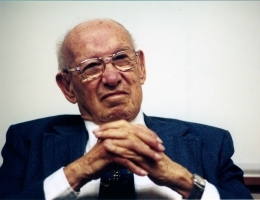 In this article I will provide a quick overview of Drucker’s main focus points to manage oneself. Managing Oneself – What are my strengths ? Managing Oneself – How do I work ? A. Am I a reader or a listener ? B. How do I learn ? Managing Oneself – What are my values ? Managing Oneself – Where do I belong ? Managing Oneself – What can I contribute ? A. Accept that other people are the same diverse unique individuals as you are yourself. B. Taking responsibility of communication. While goal might sound relative simple, it requires some thorough analysis, critical attitude and complex decision making. Let’s have a more detailed look at each of the five questions. Discover where your intellectual arrogance is causing disabling ignorance and over come it. Furthermore it can help to compare expectations with results in order get an indication of what or what not to do. In other words those companies don’t allow employees to work from their strengths or simply focus on improving the weak skills. Someones strengths are unique and so is the way how one performs simply because its a matter from personality (no matter if its nature or nurture). Peter F. Drucker uses two examples of well known people not knowing if they are a reader or a listener. Dwight Eisenhower, former supreme commander of the allied forces in Europe, apparently didn’t know he was a reader not a listener. Lyndon Johnson destroyed his presidency by not knowing that he was a listener, not a reader like his predecessor John Kennedy. Conclusion few readers can be made or can make themselves into competent listerners or the other way around. Winston Chruchill did poorly at school, simply he was not a reader nor a listener. Winston Chruchill learned by writing. Other people learn by talking copious notes, learn by doing or learn by hearing themselves talk. Understand how you learn! Some people work best as team-members, some people work best alone. Other people work best as subordinates like the used example of General George Patton. Another critical question you may want to ask yourself is whether you perform best as an adviser or as a decision maker? Organizations have (ethical) values as well. In order to perform well or being effective in a organization both the values of organization and individual must be compatible. Value conflicts result in frustration and non-performance. If you answered the first 3 questions (What are my strengths, How do I perform, What are my values) you should be able to decide where you do belong or where you do not belong ! “What does the situation require? Given my strengths, my way of performing, and my values, how can I make the greatest contribution to what needs to be done? The MBTI® (Myers-Briggs Type Indicator®) personality type can provide excellent guidance in this respect. “To be effective you have to know the strengths, the performance modes, and the values of your coworkers” (p. 8 ) just like you have them yourself. When you clearly communicate your strengths, the way you work, your values and proposed contribution, colleagues find it most helpful and respond with the question “Why didn’t you tell me earlier?”. You want to ask the same information (strengths, performance, & values) to anyone you work with. Communication will really help to build mutual understanding, matching complementary skills, increasing efficiency and building trust. In my honest opinion these might be the critical drivers for building a culture of high performance organizations, innovation and entrepreneurship as described in the book Corporate Effectuation. “Finding a second area -whether in a second career, a parallel career or a social venture- offers an opportunity for being a leader, for being respected, for being a success.” (p. 10) However you must begin managing the second half of your life long before you actually enter it, no matter which of the mentioned forms. Managing Oneself is an article of just 12 pages, that is an excerpt from the book Management Challenges for the 21st Century (Peter F. Drucker, 1999). 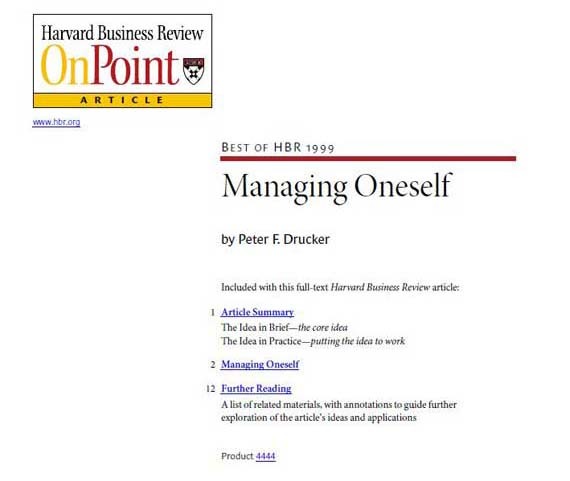 Download your copy of the Harvard Business Review article Managing Oneself of Peter F. Drucker. The Managing Oneself article is still very relevant, despite the publication almost 12 years ago. It can help a professional with personal development and defining the next step in his/her career. For me personally there are some really interesting parts in this paper that I will use in my personal development plan. Sharing is caring so I really hope it helps you as well. These questions will definitely help us to get great answers about ourselves and gives us the space for improvement. Thanks for sharing!! Hey!, I found this information for you: "Peter F. Drucker – Managing Oneself (Harvard HBR)". Here is the website link: https://www.remo-knops.com/3119/peter-drucker-managing-oneself-havard/. Thank you.